This past week I saw rpgKids hit outside of the insular D&D community and blogosphere in a big way. I was contacted by the popular BoingBoing blog to write an article about the game for them, and it led to many people picking up the game to (based on emails I got) rediscover gaming by gaming with their kids. That’s awesome, as that was always the point of the game, enjoying this great hobby with your kids. So a big thanks to the BoingBoing floks for giving me that opportunity to showcase rpgKids beyond my blog. Also, another cool thing, a few creative types out there from the comics and film/tv mediums picked up the game and tweeted about it which was kind of weird and bizzare for me in its own right. Pirates of The Endless Sea: The heroes are tasked with stopping the dangerous pirate Captain Blackbeard, who has aligned himself with Sharkmen and together are raiding Wellspring’s boats of money and supplies. The Curse of the Sleepy Mist: The evil wizard Geleron is back, and this time he has put the town of Wellspring to sleep! Can the heroes stop him, or is everyone destined t0 sleep forever? Journey to Dinosaur Island: The heroes are hired to find a magical necklace thought to be found on dangerous Dinosaur Island! The missing Unicorn: A group of fairies as for the heroes help in finding their missing unicorn, who has been kidnapped by a band of orcs. So there’s a good mix there of adventures of all types: pirates, wizards, fairies, unicorns and dinosaurs. The adventures will follow the same simple format as the “Frog Wizard” adventure from the rpgKids rules. If you need help designing adventures for rpgKids, look at it like an episode of Dora: We need to accomplish X, so lets go through encounters A, B, and C to get there. It’s simple and effective for the age range that the game is designed for. For those of you that have been waiting for the adventures, I apologize, but a bunch of real life has gotten in the way. All I can say is soon, real soon. Looking forward to the new content! And congrats about the Boing Boing article & traffic! Just yesterday, my son, not yet six, shared the entirety of his adventure defeating the evil frog wizard Geleron with a close gaming friend of ours. He had all the details bang on, even things I had forgotten, and told it masterfully. In fact he talked until our ears almost bled. His excitement was infectious. But the truly amazing thing? We played 4 months ago and he remembers it ALL. This is from a boy who normally has the attention span of a small cat tripping on catnip. To put it bluntly, I was floored. I knew he has been excited to do another adventure, but I had no idea the first had made such a huge impact. I think I’m going to whip up a quick version of the library scene shown in the demo videos. Hopefully that will hold us until the new adventure pack arrives. Looking everywere, but not finding them. Am I missing something or are they not done yet? I’ve been watching too, but I’ve not seen anything on the latest RPGKids stuff yet either. I suspect real life might be hitting our illustrious author in much the same way it is me. 🙂 My poor son is chomping at the bit for more adventure fun, but I’ve just not had the time to pull anything together for him yet. His birthday is this week though so maybe I can get it together enough for a few hours of gaming fun with him. Thank you though. The fact that there is interest is humbling. No problem man! I totally understand! 🙂 I’m definitely interested, but real life is what it is. I posted that I was going to dig out some skeleton minis and take a crack at reproducing the adventure you show in the demo videos with your daughter. I’ve not even managed to do that yet! 🙂 Heck, my house is up for sale, the munchkins are in a flurry of end-of-school-year activity, and much craziness abounds. Same here, no problem at all! Hope I did not sound belligerent… really. I was just checking because I remembered the post about pirates and the dinosaur island. I ended up playing ‘ freeform’ with my 2 boys today and had loads of fun! 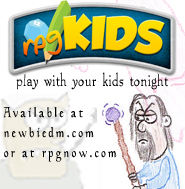 Rpgkids has really helped to awaken me to the fantasy fun my kids and me can have together. I’ll be playing rpgs with them for a long time, I’m sure.